A story revolving around a medical student who gets into an accident and receives mechanical enhancements implanted by his own father. It follows a man who is half-human and half-robot and his encounters when it comes to romance, family and friendship. 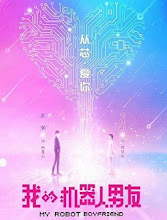 Because of an accidental meeting, journalism intern Jiang Mengyan (Rachel Mao) falls in love at first sight with Lin Mobai (Jiang Chao) and begins a one-sided pursuit to win his heart. While on a medical trip to Bingchuan, Li Mobai gets into a serious accident. His scientist father Lin Sitan (Ning Li) reconstructs a portion of Li Mobai's body to be governed by artificial intelligence. Mengyan and Mobai's meeting start a love story with many ups and downs. Mengyan becomes an accomplished news journalist. Mobai also becomes a successful young doctor. At the end, Mengyan and Mobai embrace their feelings for each other and choose to be together through thick or thin. Mobai and his father Lin Sitan also mend their relationship as father and son. Let us know why you like My Robot Boyfriend in the comments section. Please also share these fun facts using the social media buttons below.